Yes, these birds count as pests! The sparrow, or more specifically the English or House Sparrow, has been declared a household pest in Canada since they were introduced in the mid-1800s. These birds are especially bad news to gardeners, homeowners…even regular birds that are native to the Lower Mainland! The house sparrow can be identified by its colour and length. They usually grow to be about 5 to 6 and a half inches, weighing less than a single ounce. They have a grey underbelly with light or reddish brown feathers and colouring, with streaks of black. While house sparrows prefer to eat grains and seeds, they can and will eat fruits, vegetables, and even our own garbage and spilled foods. Their tendency to nest on roofs and in trees near homes makes them particularly damaging not only to gardens, but also to restaurants and any rural areas with a high population or livestock…animal feed is another favourite food of theirs. How did they even get here? Simple: 1800s beliefs. The sparrow was brought to our shores because the settlers believed the birds would help keep the insect population under control, thus helping protect farmers’ crops. Eventually, though, people realized that house sparrows will only ever eat insects when their babies, or nestlings, are young. During the rest of the year they prefer to go after the very crops they were meant to protect in the first place! On top of fire hazards and secondary pest infestations, the sparrow can also damage a building’s exterior and if left alone to populate, the building’s reputation. These are difficult birds to remove! Plus, they are carriers and spreaders of diseases including the dreaded West Nile Virus. They have also been responsible for contributing to declining populations of more native birds since they are such an invasive species. Some of these populations include chickadees, tree swallows, tufted titmice, and the Eastern bluebird among several others. Did we mention how noisy they can be, too?! 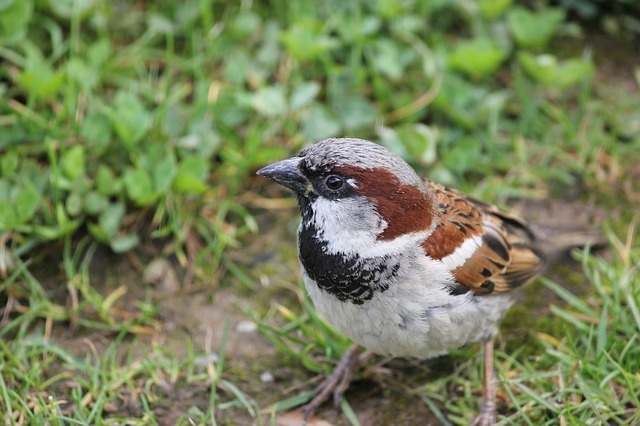 Sparrows can be aggressive pests if you let them nest for too long where you live or work. If this looks like your current pest problem, call your local Pest Boss. We can safely remove their nest and relocate these birds to an area they’re less likely to hassle. We’ll get you, varmints!